ABUJA (Reuters) - Nigerian election winner Muhammadu Buhari congratulated outgoing President Goodluck Jonathan for peacefully relinquishing power on Wednesday, a day after becoming the first politician in Nigeria's history to remove a sitting leader at the ballot box. "President Jonathan was a worthy opponent and I extend the hand of fellowship to him," Buhari, wearing a black cap and kaftan, told reporters and supporters to loud applause. The 72-year-old general, who first came to power three decades ago via a military coup, campaigned as a born-again democrat intent on cleaning up Nigeria's corrupt politics. The margin of victory - Buhari took 15.4 million votes to Jonathan's 13.3 million - was enough to prevent any challenge. "President Jonathan has placed his country's interests first by conceding the election," U.S. President Barack Obama said. Nigeria's main stock index soared 6.7 percent, posting its single biggest gain this year, and Nigerian dollar-denominated bonds also climbed amid relief at the absence of the violence and fraud that has blighted previous elections. "The context has changed ... There have been 16 years of democracy, there's a constitution, there are legal safeguards," British High Commissioner Andrew Pocock told BBC radio. Investors are also cautiously optimistic that any crackdown on corruption by Buhari will stimulate investment and boost flagging growth in Africa's biggest economy. The rules state that Jonathan must officially hand over on May 29. His People's Democratic Party (PDP) has been in charge since the end of army rule in 1999 but had been losing support due to several oil sector corruption scandals and the government's performance in combating Islamist Boko Haram militants. 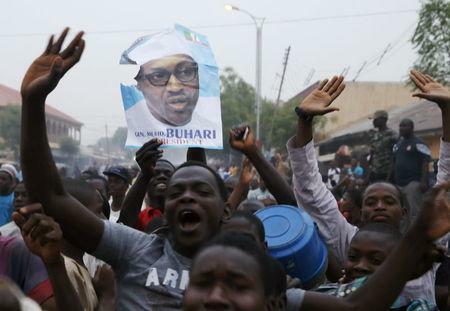 Cities in the largely Muslim north, where Buhari's core support base lies, erupted in celebration. Jonathan's appeal to his supporters that "nobody's political ambition is worth blood" meanwhile helped calm their frustrations, reducing the chance of post-election violence that blighted the 2011 poll, when Buhari lost to Jonathan. Despite the killing of more than a dozen voters by Boko Haram gunmen - who had pledged to derail the poll - the election was one of the most orderly in the country's history. Buhari took power in a 1983 coup only to be thrown out 18 months later by another general. He subsequently embraced democracy, running in several elections and despite losing always bounced back. He acknowledged the hard work ahead in building bridges. "I ask that we all be circumspect, respectful and peaceful ... We must begin to heal the wounds," he said. Oil-rich Nigeria remains a complex ethnic mix of 170 million people speaking more than 500 languages, split between Muslims and Christians. Though they mostly live side by side in peace, many harbour disputes that politicians have often used to stoke violence that has worsened over the years. As well as the Boko Haram insurgency Buhari must deal with the fallout from a dive in global oil prices in the last eight months which has hammered state revenues and forced two de facto currency devaluations. "He's a man with a strong sense of mission and he has clear ideas about what he wants to do with Nigeria, on corruption, on restoring national discipline," Pocock said. But pledging to crack down on the graft and doing it in a country where it is so endemic are different things, and analysts say it is a project that could take decades.